Patriotic Front (PF) President Edgar Lungu is very unlikely to attend this evening’s presidential debate as he fears to scare away even the little votes he has gained by keeping quite after saying he has no vision on Radio Phoenix last year. Lungu was set to appear on a live debate with Nevers Mumba and UPND’s Hakainde Hichilema. 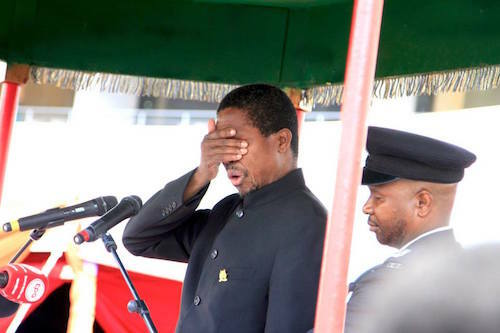 Information reaching the Watchdog indicates that Lungu has been advised by his campaign team to stay away as he risks being embarrassed owing to his poor grasp and articulation of issues. His campaigners have decided to follow the adage that ‘even a fool looks wise by keeping quiet’. Lungu will lie that he is too busy campaigning somewhere in the villages and claim that he can’t spare a few hours to debate as he started his campaigns later than others. But this is the same person who has been taking off whole days to rest in the hit of the campaigns. Besides, the national debate will be aired on Muvi Tv and other Radio Stations and ZNBC is free to beam it to the whole country so the debaters will have the largest audience today than speaking at a poorly attended rally. Hichilema who was by 12 hours today campaigning in villages near the Zimbabwean border will still manage to return to Lusaka and debate, so what can’t Lungu do the same? MMD President Nevers Mumba and UPND President Hakainde Hichilema have both confirmed their participation in the presidential debate.